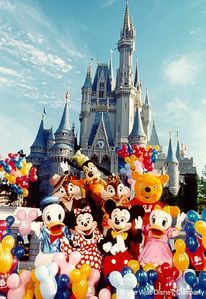 "Picture You and Your Family renting a Luxury 5 Star Villa in Orlando. 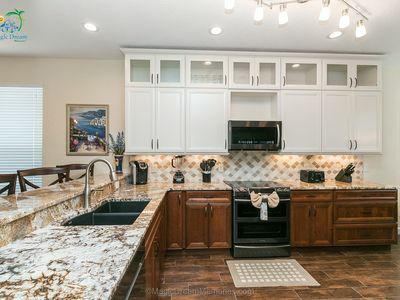 This stunning villa has 6 bedrooms, private pool and more, only 10 minutes from Disney"
'Sunrise Dream' is an amazing Kingston 6 bedroom luxury rental home that is just perfect for large family groups spending some essential vacation time together in at the Encore Club at Reunion Resort. 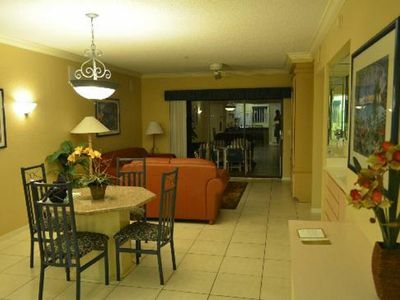 Just 5 miles from Disney, the Encore Club offers a truly luxurious retreat for vacationers providing guests access to their own water park, clubhouse, sports and fitness center. With 2911 sq ft of air conditioned comfort, the 6 bedroom Kingston model offers two floors of beautiful and spacious open plan living space with a fabulous king sized master bedroom suite, three king sized bedrooms with a private en suite, and two king sized bedrooms with access to a nearby family bathroom. 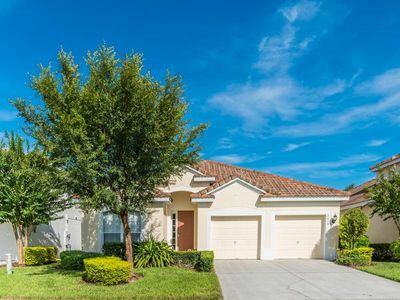 Of course, there's also that luxury pool and fabulous Florida sunshine! A fabulous home in an elevated position overlooks the Encore Club Resort's spectacular Aqua Park and Clubhouse. Close enough for convenience, it's easily walked, but still retaining a sense of peace and tranquility, this 6 bedroom Kingston home is a perfect choice for 2 or more families to share! 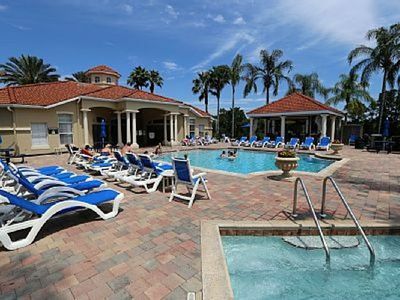 The central location within this upscale resort is perfect for guests that love to schedule a few 'lazy days' around the resort pool, amongst that hectic theme park itinerary. 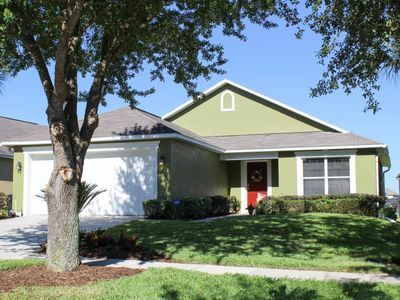 The stylish layout of this home offers a perfect retreat for families looking for a spacious luxury pool home in the Disney parks area of Central Florida. With an open layout, guests can enjoy one of two comfortable living spaces to relax, watch TV and socialize in air conditioned comfort. To the front of the home's ground floor, 3 comfortable sofas and a large wall mounted TV with Xbox & PS4 games console offer a great opportunity for guests to relax, play and socialize in their own space. 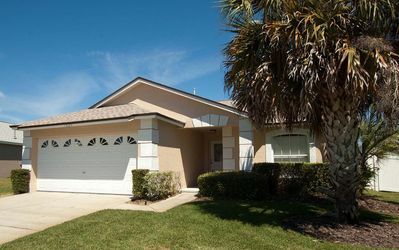 To the rear of the home, in an open living space that includes the fully equipped kitchen and 5 seat breakfast bar, a further main TV lounge with a large sectional leather sofa, overlooks the pool deck. A 4 seat breakfast table also offers a great spot for quick meals and casual dining. The kitchen includes stainless steel appliances, granite surfaces, microwave, refrigerator, freezer, oven, burners and dishwasher. A nearby laundry room includes washer and dryer. The family living area includes pool access through glass sliding doors. The pool deck includes a covered lanai and patio furnishings. 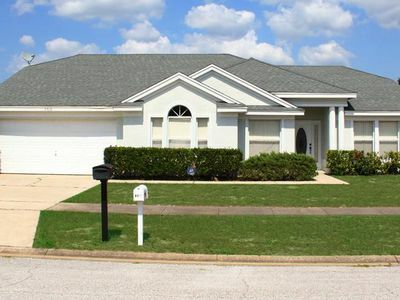 The home benefits from a larger lot and a very usable lawned area for play and relaxation. The lawn benefits from sun for much of the day. 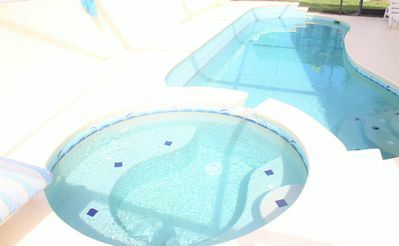 The pool and spa can be optionally heated. A child safety fence is fitted to this home's pool area. A king sized bedroom is located to the rear of the home's ground floor and has access to the nearby family bathroom (with shower). Towards the rear of the home, a king sized bedroom includes a bath, shower and twin vanities. A room with full and twin sized beds. 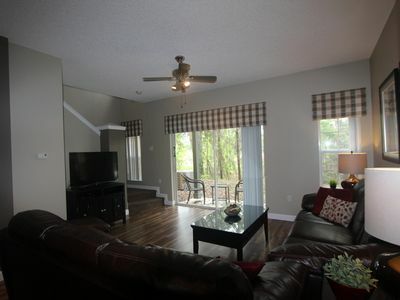 A queen sized bedroom is located to the front of the home and includes a bathroom with shower.